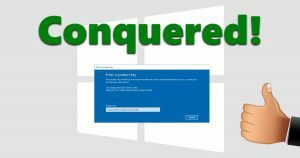 Regular readers are aware that I have been doing battle with re-activating Windows 10 after performing numerous major upgrades on various puters. I had another opportunity recently to upgrade yet another machine… This time, the entire computer was replaced – except the graphics card and power supply. Once again, I was confronted with an activation error after the upgrade. Out of desperation, I tried something crazy… and it WORKED! This time, I did the old Microsoft Account trick, and once again, it didn’t work. So then, I did something totally nutty: I switched back from a Microsoft Account to a local account on the upgraded puter. And then I tried to reactivate with the same old Windows 7 product key that was originally used for the free upgrade to Win 10 on that particular machine. So, I guess MS is “blocking” the Microsoft Account Trick – even though their own support site says to use that technique. Whatever! Forget it. Just upgrade the machine, skip the MS account switchover before and after. When it comes time to reactivate, just go to Settings -> Update & Security -> Activation and click Change Product Key. Enter the same product key, and Bob’s your uncle. It appears that when Win 10 sees the new hardware, it resets the product key back to the “default” Win 10 key that will be used if you install the OS without one (yes, you can do that). Re-entering the same valid Win 7/8 key that you used for your free upgrade to Win 10 then goes through without a hitch, and you’re re-activated… as long as you are logged in with a local account. ← Is a microwave oven a good smartphone Faraday cage? I planned a two-pronged upgrade: a 32-bit to 64-bit of my free Windows 10 from 32-bit Win7 upgrade, new motherboard with including cpu and memory. The software part went as it should. I logged into the user account tied to my Microsoft account. I was not activated. I had the option to Activate which I clicked on. I was asked for my Microsoft password, which I entered. Bingo! Activated again. Proof my machine was linked to my Microsoft account, Two days later I did the hardware part. That to went well. Again logged into the same user account connected to my Microsoft account. Of course not activated. Even though I had read your ENTIRE article I decided to try the the Troubleshooter anyway. Did it three times, no joy. It said the servers were busy. Really! So, I rebooted into my everyday local account. For kicks, even though I have my Win7 OEM COA, I downloaded two of those little programs that find your hidden key. They both found the same key no problem. However it was not my Win7 key. Where did it come from? No idea. I tried it. It wasn’t flagged as bad but did not work. Finally I used my Win7 COA key, and, VICTORY! All this took place March 14-18, 2019. I thank you for ALL your helpful advice. Glad you got everything working! I think what Win 10 is doing after hardware upgrade is changing the product key to the “default” one that lets you install and test Win 10. I started paying attention to the key I saw after different H/W upgrades, and it’s always the same one. Re-entering the original Win 7 or Win 10 and activating with that goes through okay. Not sure why it’s so complicated, but at least it works. Just updated MB, CPU, Memory and System Storage to M2 device and could not activate Win 10 Pro that I had transferred to the new M2 storage. Carried out your “Fix” and hey presto an activated Win 10 Pro on my upgraded system. Now I’m ready for the next PC upgrade. WOOHOO!! Glad I could help.